September is the month of fabric for us! There are two events planned in New Zealand in Auckland and Carterton in the Wairarapa. Lots of amazing and unique fabric and sewing bargains. Join us! Wellington are having their fabric-a-brac on 10 June – usual venue – St Annes. Usual great fabric selection, great people and great chat! St Anne’s Hall, Newtown, Wellington New Zealand. More announcements on this year’s events coming up soon. Auckland and Palmy coming up! We are excited about the samples of stashes we are seeing coming through for the upcoming FBBs in Auckland and Palmy. Auckland is oversubscribed – Palmy is a little bit further off so a few tables still available. We’d love to see you there! Keep in touch on our facebook page and check out some samples of fabric that will be on offer in Auckland! Yup, we’re definitely coming into Fabric-a-brac season! Do I need to say more? Get your fabric projects lined up and head down to one of the regular or new Fabric-a-bracs coming up soon! Check them out below. Remember, you can donate fabric for the charity table if you don’t want to have a table – have a look below and get in touch with the coordinator to find out more. 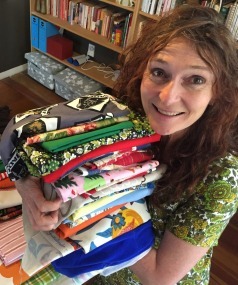 Josie Brennan holds a teeny tiny bunch of fabric, compared to what will be at the event! With a lovely bunch of people, fabric, yummy sweet treats and tons of fabric – we’re looking forward to an awesome Saturday on the 31st in Palmerston North. We have had a huge amount of fabric donated to Hospice and there are a number of stalls with ‘nana stashes’ so there’s bound to be some amazing finds. Check out the stuff.co.nz article from today. Thanks Nick McBride for the write up! Thanks to all who took part in Auckland’s FBB a couple of weeks back. Another great event with an awesome vibe. Looking forward to Wellington and Palmerston North now! 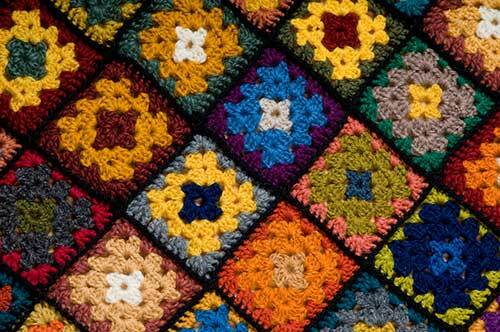 Lovely Granny Squares – revive this craft! Two New Zealand FBBs down, and two to go! Auckland was a huge success again, with the venue proving to be a hit. Now we’re amping up for Wellington on October 10. Wellington is the home of FBB and always has an amazing range of fabrics, as well as a beautiful cafe set up – vintage cups and AMAZING cakes galore. Make sure you have it in your diary. There’s still spaces for stallholders in Palmerston North too – fill out the form if you are interested.